Bruce Campbell on the CNN Express bus at this year's San Diego Comic Con. What you need to do is get into latex to make your skin look different. You need to get into some colors to make yourself not look normal. Derma Wax [also known as Mortician’s Wax] is good for bumps and lumps. Between latex, Derma Wax and clown white, you’re halfway there. A good blood recipe is critical. Most people don’t know how to do good blood. It’s a corn syrup base, the Karo corn syrup. Get the clear kind, not the dark kind. You mix everything in that bottle; you don’t even change the bottle. Take the lid off and pour in some coffee creamer that’s already been mixed up, like Coffee-Mate. Blood is opaque, so you need a little bit of white opaque mixture in there. It could be milk, but it will go bad on you, so I say a non-dairy creamer. Mix that up, get the lumps out, pour a little of that in. You might need a drop of blue food coloring to keep it from getting too pink or too red. But don’t put in literally more than one or two drops because it will turn it to make it purple. Coloration is key. It will stay extremely sticky. A note to everybody: It will get on everything. Whatever you touch, it will get on it. Be judicious with it, or don’t care about it. Blood is one of the main things that if you get it wrong, you blew it. You can use egg whites on your skin. On the beauty side, it’s a little known secret that some women will put it on under their makeup because it’s an instant lift to the skin, and it tightens the skin. But if it’s put on in a little bit more of an amount, it will crackle. If you put some red paint (like the devil makeup) over the skin, and put the egg white over it, it will crackle the makeup. It gives a really interesting texture to the skin [and works as an old man makeup]. There’s also black eyeliner on the lips. You can line your lips, fill it in, and make really great, scary-looking lips. Use black and brown and blue eyeshadows to create really great colors under the eyes. But as far as really trying to make it look good, and pass as fairly decent makeup, I’ve done a lot better to go buy some simple pieces from a local Halloween store. The instructions that come with them are so simple and so easy to do now than they were way back when. You couldn’t even find this stuff … there’s so many stores now that do cater to that person wanting to take it to the next level. That would be my best advice to someone really wanting to make it look good. So many stores have come so far with what they sell. The techniques go back to Godzilla days and making a creature out of foam rubber. For that you usually work with anything from one inch – to one-half inch, depending on what you’re making – of a light mattress foam you get from an upholstery place. The best way is to order it from a place that just sells that. And then get contact cement. It’s a similar process to clothing fabrication except you don’t have to sit there worrying about sewing or seams. You’re sculpting with the foam. It pulls its own shape when you bend it and curve … this is way of making a very simple creature body. The texturing is a matter of finding latex – which is sold in any art store as a mold-making product – that you coat it with. Then you cut into foam and glue the edges, and pinch texture into it, or burn it in with a soldering iron. But don’t breathe (the burning latex smoke), because it’s dangerous. Or you can actually texture the surfaces with oatmeal, corn meal, stucco, all sorts of things. For a simple gore effect, my favorite requires liquid latex, a large piece of glass or mirror or something smooth. Spread some colored latex – colored with a little bit of acrylic paint, red paint with spots of blue and kind of blend it – in an even, thin layer on the glass. Let the latex dry, and it will stick to itself when it dries. Put a piece of thick yarn in the center, and start on one edge and – kind of like a Fruit Roll-Up – roll it around that cord or yarn in the center. You don’t have to be even with it because it looks more natural when it’s not. Just keep rolling until basically you’ve got a long pinkish, bluish, purplish rubber tube. Then you force it against itself into a squiggly back-and-forth shape, and you’ve got perfect intestines. Dip those into some fake blood and it’s just awesome. The new site is pretty neat Josh . Now all I need to do is beomce more computer literate ( ha. ha.) It's hard to teach old dogs new tricks but old dogs tend to remember after they crash and burn a few times. Wow, thatis what I was searching for, what a information! existing here at this webpage, thanks admin of this web page. And it did get EVERYWHERE...but it looked great! I think you mean Tom Savani...? He did the special effects in those movies, and still does them today for Tarantino's movies and I'm sure a good amount of others. More Bruce Campbell ! Time for another Evil Dead movie ! Or at least, another Bruce Campbell book, I loved the last one ! One of my Favorite BC movie is: Bubba Ho Tep ! Ah, Bruce Cambell's blood recipe. That brings back memories....of scrubbing that crap out of the back seat of my car. I've loved Bruce since the beginning. He was Secksy then and he's even secksier now. I'd watch him doing nothing more than reading a phone book. Loooove his voice. 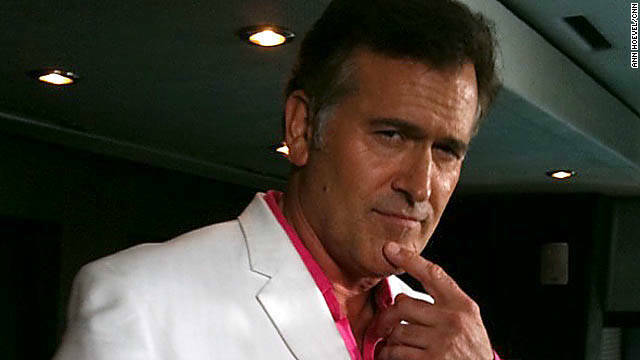 I LOVE Bruce Campbell! I don't care what age he is. Campbell's Soup is Mmm... Mmm... Good! Awsome actor. Bruce, if you are reading this – Now is the time for a full NO S&#T publicity campaign since you are probably the closest to the average dude out there. People can relate to you and you can relate to people. People don't really want to hear from the big names, but I guarantee they want to hear from you and you will get bigger because of it. Shop smart. Shop S mart! His movies are all great. Bruce brings a viable alternative to my usual blood recipe. Might have to play with that one. Time for a Burn Notice spin-off called "AXED!!!" Bruce rules! We Need more Bruce! I can't believe he isn't doing voice overs on animated films or something. He just rocks baby. Bruce did a voice on Cars 2, "Rod 'Torque' Redline". I concur! Bruce is the MFing man! He was so hot when he was young. 'When he was young'? Honey, he still looks good and has a great deal of charm. Guess what, Lila? The fortunate among us age. The unlucky die young. Wow...you must be a really old, insecure and bitter woman Chartreuxe. Nah, it's mostly that you're young, scared and immature. Indeed. What I am is a survivor of *three* different cancer diagnoses. I'm very fortunate to be alive. Most women (like me) who are diagnosed with ovarian cancer die. The fatality rate is 75%. Considering the alternative (death), it's better to be walking around than a good-looking corpse. YMMV. Amen, sister. The hilarious thing about the young who successfully survive is they get older, and it happens so much faster than they expected. The years just roll past, faster and faster. Congrats on being a fighter! Talk about blowing words out of proportion. I'm 40 and had a huge crush on him when I was teen. That's it, no other meaning was implied. So When Is Sam Axe going to bring out his "BOOM STICK" ? Is there anything Bruce Campbell can't do?